These kits allow you to install a Benelli C-stock (aka skeletonized, collapsing, telescoping) onto your Benelli M4 shotgun in a fixed-stock configuration. C-Stock is not included, you'll need to acquire that elsewhere if you don't have it already. The stock can be fixed in any of the 3 positions (or in some cases, 2 positions) of your notched recoil tube. Note: If your M4 model's recoil tube only has a single notch, then you do not need this product as the stock already cannot collapse. 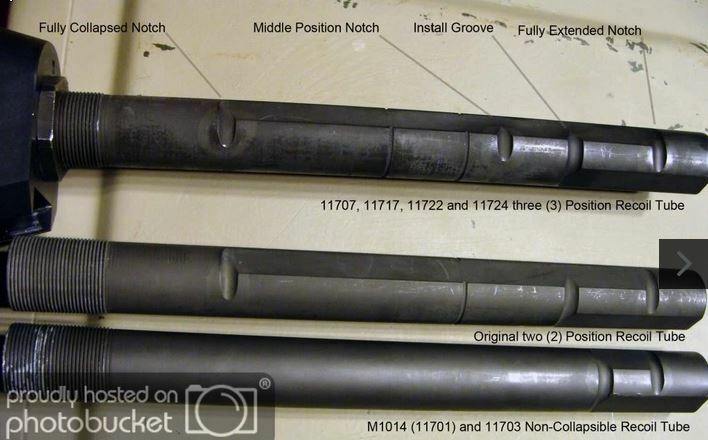 To determine which recoil tube your M4 is equipped with, see this picture. This kit and the installation procedure are completely reversible - you can use the provided hex key to return the stock to its collapsible configuration for use outside California, or to change the position of the stock (note: fire control group must be removed before and during stock re-positioning, if done in CA). You can choose to retain your original unmodified button in case you decide to permanently return the C-stock to non-CA configuration. Installation requires no machine work at all, it is a simple parts swap. Note: This has not been tested with the ProMag brand version of the C-stock. If you order it for a ProMag stock, and it doesn't work, you can send the kit in like-new condition back to me for a refund (less $5 for shipping and repackaging costs). PayPal only at this time, PM me for payment instructions. I'm also offering a rebate of $20 if you decide not to keep your original button, and send it to me in like-new condition so I can recycle it into more kits. Edit: I just sold out of all the kits I had on hand, but a few more will be ready in 2-3 weeks, you can pre-order to be sure you get one from this next batch! Last edited by cockedandglocked; 02-08-2019 at 1:38 PM.. The button looks great, awesome work. Last edited by cockedandglocked; 02-08-2019 at 1:36 PM..